It has been over a year since our post, Like Mother Like Daughter, where we attended our friends Sim and Tobi’s baby shower for their little girl (Madison) who is now a year old. Our Aussie friends are the epitome of style and class, and when they came to us wanting help with the decor for Madi’s 1st birthday party we were so excited to be in on the fun. This past Sunday, was a perfect day for an outdoor party. It was warm enough at Sim and Tobi’s home in “Sunny California” for their guests to catch up and the children to play outside. We added just a few small touches to their backyard in the party’s signature colors; hot pink, turquoise, and purple. These over-sized tissue paper pom poms and fringed streamers set the tone for a girly celebration. This is our amazing ombre fringed one’s third appearance at a 1st birthday party (seen on our previous posts: A Blog Birthday Party and Mika’s 1st Birthday Party). It really tied in well with the look of this party and was a perfect finishing touch. Indoors, Sim set up trays of fruit cut small so the kids could enjoy as well and mini blueberry muffins. This adorable pink pail read, “Munchies for the kids. Love, Madison”, and was filled with the birthday girl’s favorite snacks. For the adults, Sim and Tobi added a few special surprises. Crepes were prepared to each individual’s order (including delicious toppings such as fresh strawberries and bananas, nutella, chocolate and caramel sauce, whipped cream, and powdered sugar). They also had a barista come and give the parents their caffeine fix. Longshot Australian Roast was the perfect choice for this couple and their many Aussie friends. The kids had their fun too! Toys were brought out onto the grass and Madi and her friends “had a ball”. Madison is a born pet-lover. So we were not surprised when Sim and Tobi mentioned they would be inviting two ponies to the party. Madi showed her love for her first pony ride by raising her arms mid-ride and yelling “hooray”. We created this fringed card and envelope to match the party’s look. Although we were specifically asked not to bring a gift, we couldn’t help but give Madi a little something special to celebrate this big day (wrapped in pink, of course). In lieu of a gift, Madison’s parents asked their guests to wear purple in honor of Purple Day for epilepsy (a cause that is very close to their hearts) and that they give any loose change they may have on them as well to this great cause. Madi gave a gift to her friends as well … a little something bubbly. Unfortunately, nobody ever remembers their first birthday. Madison will have to rely on pictures for that. What’s important to a one year old (besides pony rides in their own backyard)? Being allowed to not only eat your first cupcake but make a mess as well! We will admit, Madi was not exactly sure what to do when she first was approached with this Suziecakes’ cupcake, but it did not take her long to dig right in. Happy Birthday Madi! We had so much fun working Side by Side with your parents to decorate for your party and loved being there to celebrate your 1st birthday with you. We look forward to many more birthdays to come. Tonight is the first night of Passover, and although it is not easy to give up bread for a whole week there is something we always look forward to … matzah ball soup. For as far back as we can remember we have always made a huge pot of this comforting soup to last us through the week. When we were younger, we would help our mom prepare the vegetables and form the matzah meal into balls to plop into the pot watching as they fluff up. The house always smelled the best on these days. Last Passover, we got the opportunity to relive this childhood memory as we once again made matzah ball soup with Mom. Mom’s version consists of lots of hearty vegetables including whole white onions, baby carrots, celery stalks, and parsnip. Each matzah ball is dropped into boiling hot water mixed with chicken consomme. Leave all ingredients in the pot to simmer for hours until the matzah balls are fluffy to perfection and the vegetables are soft and scrumptious. Mom also loves to add chicken breast to her matzah ball soup to make for an even more complete Passover meal. We really can’t wait to make and devour this year’s matzah ball soup. It continues to be our favorite part of Passover, and a tradition we hope to share with our kids one day. Happy Passover from Side by Side Design! In our previous post: Mikey’s Helping Place, we introduced our goal to collect 200 handmade cards (in honor of our 200th blog post which is today!). These cards will be sent to a fabulous charity called Mikey’s Helping Place. In order to contribute our own handmade cards, for this month’s Craft Club meeting we invited the girls over to craft for a cause. Please check out our post (seen above) for more information on how to get involved and help us reach our goal. This month’s meeting was a bit different from others we have had in the past in that it was really all about giving. Therefore, it was extremely important to us that the girls who came felt like they could keep their focus on the cause and not what supplies they needed or what food to bring. In the end, we decided to provide all snacks and supplies and allow the girls to come empty handed, but leave knowing they did something to help others. Our all Mexican style spread consisted of: veggies with fresh salsa, chips and homemade guacamole, and veggie wraps with black beans, cheese, avocado, red bell pepper, spinach, and salsa. We had so much fun putting together the supplies for this project, as we were inspired to make children’s cards in cheerful colors and prints. We are so happy that we are able to celebrate such a special time for our blog by giving to others. If you (our readers) have a heart to help out a great cause, create a couple of cards or even get a group together and work on them Side by Side to send in. We are also looking for other craft clubs to challenge to see if you can make even more than we did. For more information (including where to send this donation) please contact us at sidebyside.design@yahoo.com. Since our dad is a carpenter who works on many amazing projects, we love that we have had the opportunity to work on some with him. However, when the opportunity arises to work on one of our own personal homes, we enjoy working together Side by Side to bring our vision to life. 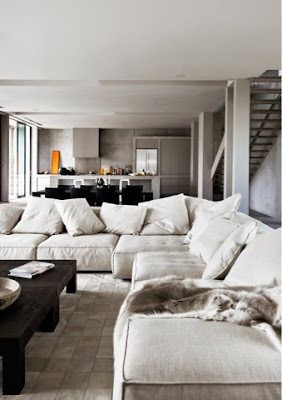 In this case, our dad has been wanting to change up his living room for quite a while and we feel honored to be helping him with the design. After many discussions about their vision, we decided to pull together an overall inspiration of how we see it all coming together. This photo really paints the picture for the overall look they would like; earthy tones in a monochromatic palette and ultra comfortable seating mixed with small rustic touches and textured walls. 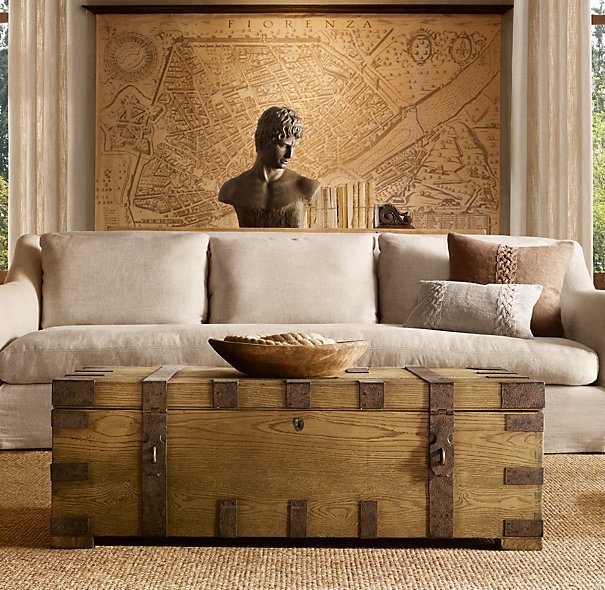 This sofa and trunk coffee table from Restoration Hardware are the main inspiration for the furniture we would like to use in this space. The sofa in a neutral linen fabric with a chaise on one side will make for comfortable seating, and as storage is essential in their home the trunk provides an extra space for that while still looking chic. A brick veneered wall will add texture to the space and creates a nice way of tying the dining room and living room together. Their wood flooring will be re-stained in a nice brown finish adding to the monochromatic color scheme and warming up the space. The finishing touch is this beautiful cable knit rug (also in a soft neutral color) adding yet another texture and softening element to the space. After many years of talking about it (and so many other projects we put before our own), we are so excited to get going on this one. It is always fun for us to get the opportunity to work with our dad. Especially on such a personal project, and we can’t wait to show you more throughout the process from construction to completion. 1. Whip up your cake batter as usual and add in some green food coloring (but remember, a couple drops goes a long way). 2. Dress up your cupcakes with creamy white frosting, green sugar sprinkles, and Lucky Charms cereal. 3. Bring a tray of these delicious cupcakes with you when attending your St. Patty’s Day party. They will be a huge hit! 4. A bowl full of Skittles and Rolo candies will help you “taste the rainbow” this St. Patrick’s Day. You may even find your pot of gold at the end. Wishing everyone a Happy St. Patrick’s Day and a wonderful weekend from Side by Side Design!